1. 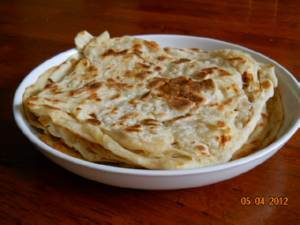 Contrary to popular beliefs, Roti Canai does not need or contain a lot of oil. 2. The main objective is to create a super thin dough without tearing that can passed the window pane test. The thinner the dough, the crisper would be the roti when fried. 3. Oil is used liberally only in the final process more as a lubricating agent in the stretching and to prevent the thin dough from sticking together. Hence the misconception that it contains a lot of oil. 1. Mix the wet ingredients together and give them a good whisk. 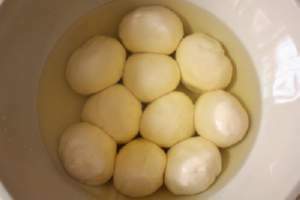 3 .Dust the dough with flour then divide them like a ball , about 100g each. Ensure the bottom is smooth. 4. Coat them with oil or soak them in oil (see below) to prevent drying and again rest them for at least 4 hours and up to 8 hours or overnight. The resting breaks down the gluten in the flour and makes the dough more pliable and easy to flip. Cover the dough balls with cling wrap to keep the surface from drying out. Soak in oil -I prefer to soak them in some soil to prevent drying. I find the dough is easier to handle after 4 hrs; I need not use any more oil. 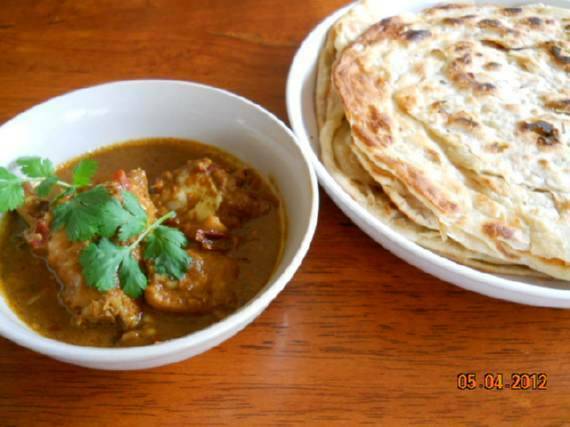 The same oil may be used to smear the table top and for frying the Roti. Any excess can still be return for general cooking and not wasted. Square and Round shape Roti. The secret of flipping the dough is lifting and pulling. 1. You lift the dough in the air with the right hand and pull it with the left hand. 2. After each flip you, take another section or corner of the dough and repeat the same process. Watch video by Dr Leslie Tay. 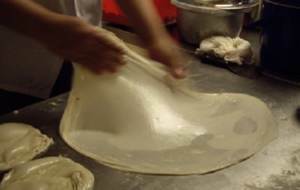 The 2nd method of stretching the dough is very similar laying a bed sheet. You take one corner of the bed sheet and pull and stretch to straighten it out. (at the same time you trap some air underneath.) Then you repeat it with another corner.